The Cassini C-60090TR telescope is mounted on Cassini's new Tracker altitude/azimuth mount! It's easy use up and down, left and right movement is great for beginners and casual star gazers alike! Terrestrial viewing is extremely easy too due to the included erect image prism which produces a totally erect image. The Tracker mount features simultaneous slow motion altitude and azimuth adjustment enabling precision micro vertical and horizontal manual tracking and rests on top of Cassini's sturdy, fully adjustable, pre-assembled metal tripod. The tripod also features an accessory tray with slots to place 4 1¼" eyepieces or lenses and retractable rubber feet. The Cassini C-60090TR utilizes a 90mm two element achromat (color correct crown & flint) fully multi-coated air spaced objective lens. The optical tube assembly features an 600mm focal length and the tube itself is aluminum, painted flat black internally, and fully baffled for excellent visual and CCD imaging. 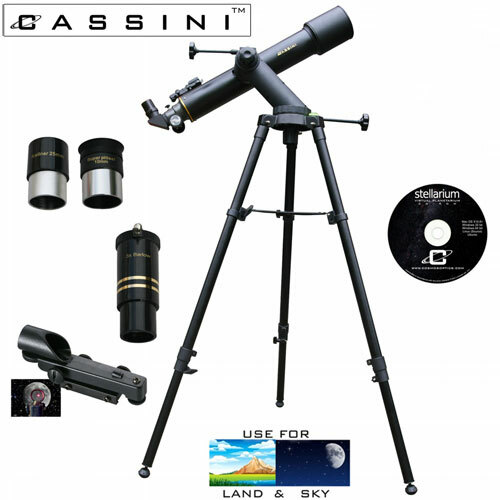 The finder is Cassini's Red Dot Mars-Eye Electronic Finder which helps by getting the observer behind the telescope without losing the surrounding field of view when targeting objects. Included with the C-60090TR are a 1¼" 10mm Plössl eyepiece, a 1¼" 25mm Astroscopic Eyepiece, and a 2 element 3x Astroscopic Barlow. Lastly, the Cassini Stellarium CD ROM brings skies over your home or anywhere in the world.